it is clear that the Yallarhammer fly pattern was created before European settlement of the Americas. It is generally accepted that the Cherokees brought down a Yellow-Shafted Flicker with a blowgun, wrapped its bright quill around a hook, and caught a trout. This is an extremely easy fly to tie. Fishing it is equally simple. Cast down and across stream and strip the fly back in short 2 to 3 inch movements. This is an especially good fly for streams having high and discoloured water simply because the fly pushes lots of water and therefore makes quite a commotion which makes it easy for the fish to find the fly. 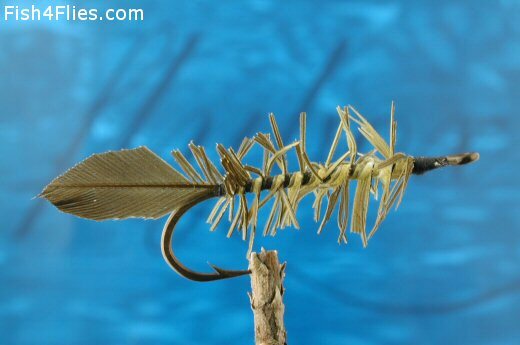 The reversed hackles are made by cutting narrow strips of deerskin with the hair left on, wrapped around the hook a few times, and well tied at each end. The North Carolina Indians (Cherokee) tie them to perfection, using some sort of cement or waterproof varnish over the thread, and for the bodies the various colours and length of hair from different skins. They use rather stiff hair, preferring it from the deer's legs. They often cut the hair off and use it without the skin, but made in this way the flies are not as durable. They use feathers occasionally in the same way. Currently there are no comments about the Yallarhammer fly pattern from other fly fishermen yet.